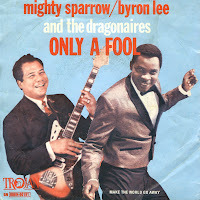 'Only a fool' was a hit for Mighty Sparrow, Byron Lee and the Dragonaires twice: originally in 1969 and then again in 1978. In 1969 the single reached number 31 during its three week chart run. When it returned, entering the Dutch Top 40 on December 31, 1977, the single stayed in the chart for 27 weeks (!) and reached number 2. When it charted in 1978 I got to know this song, but I felt it was a dull, boring song. Now that I'm older, I quite like the old sound of this track and the melody really fits the melancholy lyric. Sometimes you need to get older to appreciate certain music.